Putting fresh clean SOCKS on the feet of anyone who needs them. Whether they live on the streets, just can't make ends meet or even emergency services will all be welcome to tap into the resources of the many Volunteers collecting. 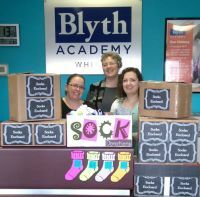 All SOCKS stay in the community where they are collected....and we thank you from the bottom of our hearts..........and toes. Every month more than 800,000 Canadians rely on Food banks, and SOCKS are one of the most needed and least donated items to these facilities. SOCKS are more than an article of clothing to those who have so little. They offer warmth, health, a symbol that someone is looking out for them, ownership, and pride. SOCKS make the forgotten poor feel wanted and loved again. In the fall of 2014 an organization called SOCKS was born. 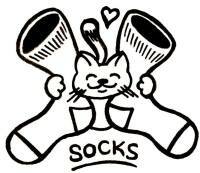 We collect new SOCKS, and the salary for setting up a collection station is a deep warm feeling of joy. Keeping the organization at a Grassroots level means that anyone can participate. Founded on the principle that everyone deserves new warm SOCKS, collection stations starting cropping up throughout Ontario. As of 2016 more than 50 Collection stations in 16 towns and cities have been opened, and the SOCKS family continues to grow every day. We started on Facebook and have grown using the "I told two friends and they told two friends and so on". 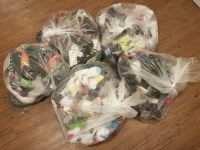 Our first year 2014 started off with a goal of collecting and distributing 2014 pairs of SOCKS but that quickly was reached and a new goal was set of 4500 pairs. 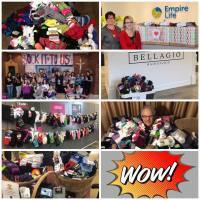 In 2015 our goal was to collect 10,000 pairs of SOCKS and distribute them in many Ontario towns and cities. 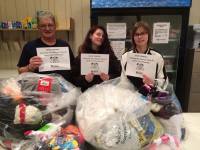 Once again, we far exceeded that goal - collecting and distributing 17,860 pairs! 2016 brought an ever bigger challenge with a goal of 25,000 - and we came so close with 23,279 pairs collected. 2017 was an amazing year for SOCKS. We had a goal of 30,000 pairs, and obliterated it with an incredible 42, 525 pairs collected. Our goal for 2018 is a whopping 50,000 pairs, because the need is great. Socks warm feet....we all know that but....SOCKS also warm hearts, letting people 'feel' the love, the protection and the humanness that SOCKS delivers. Each of these is a Facebook page and if you would like to join our team please contact one of us and we will show you just how easy it is to make a difference. You can join one of these existing teams, or start one in your own community!